Speaker, Himachal Pradesh Vidhan Sabha, Brij Behari Lal Butail raised the issue of Pong Dam oustees with the Ashok Gehlot, Chief Minister of Rajasthan and requested him to provide all possible help to initiate measures regarding rehabilitating them. 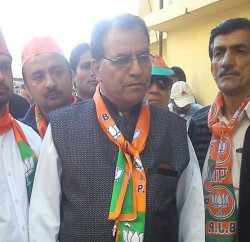 He said that the Himachal Pradesh government was serious to give displaced people their due right. Gehlot assured that the Rajasthan Government would provide appropriate assistance and would provide adequate land to Pong Dam oustees according to the list of displaced persons as received from Himachal Pradesh Government. Butail met Ashok Gehlot at Jaipur last evening. It was a courtesy call. Butail honoured the Chief Minister of Rajasthan with traditional Himachali cap and shawl. Gehlot gifted a ‘Coffee Table Book’ based on the art, cultural and traditions of Rajasthan to the Speaker. 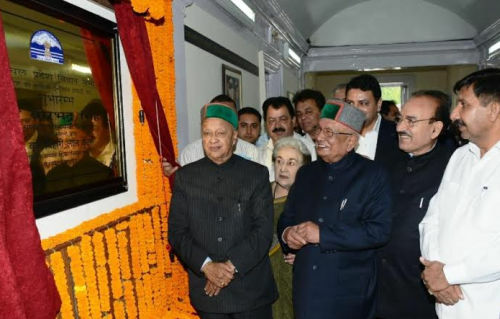 Himachal Vidhan Sabha speaker Brij Behari Lal Butail also meets his counterpart, Deependar Singh Shekhawat. Shekhawat detailed Butail about the working of Rajasthan State Legislative Assembly and also regarding the on-line system adopted in Rajasthan for Vidhan Sabha questions. Shekhawat presented a memento and also a book containing information about literature and history of Rajasthan Legislative Assembly. Ram Narayan Mina, Deputy Speaker, Vidhan Sabha and MP Gopal Singh Shekhawat were also present.